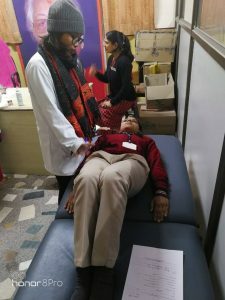 As a part of the ‘Health for All’ mission, Faculty of Applied Sciences, Manav Rachna International Institute of Research and Studies conducted a Community Health Camp at Shirdi Sai Baba School, Sec-86, Faridabad under the aegis of Dr. O.P. Bhalla Foundation. A team of 11 health professionals from Physiotherapy and Nutrition assessed a total of 197 patients at the school. Most patients were found to be suffering from postural alignments, back ache, knee pain and reported with faulty movement pattern. Regular exercise, ergonomic advices and life style modification were emphasized upon to halt and alter the deterioration level of the patients. Special group of patients having complained of Hypertension has been assessed thoroughly and advised lifestyle modification and importance of regular aerobic exercises. The Nutrition counseling was also given as per the special requirements of students. They were advised on the importance of healthy nutrition & active lifestyle. The patients were advised to visit Physiotherapy OPD at Manav Rachna campus for further treatment.